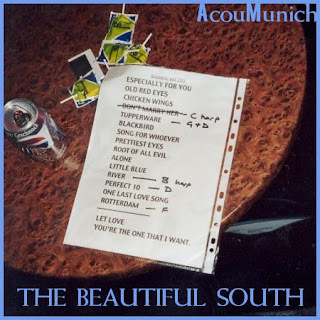 This is The Beautiful South performing an acoustic concert on the 29th November 2001 at Boeblingen, Munich, Germany. The concert was subsequently broadcast on Bayern 3 (3rd December 2001) and WDR2 (20th January 2002). Paul Heaton, Dave Rotheray and Dave Hemingway are all performing, I am not sure if any other members of the band were involved. The band were supported on the German gigs by a young German band called 'Lost In Venice' from Stuttgart. The Beautiful South formed at the end of the 1980s by two former members of Hull group The Housemartins, Paul Heaton and Dave Hemingway. The duo were initially joined by Sean Welch (bass), Dave Stead (drums) and Dave Rotheray (guitar), all of whom stayed with the group throughout their 19-year career. Later additions included female vocalist Briana Corrigan; she was replaced by Jacqui Abbott, who in turn was replaced by Alison Wheeler.